Playing more overhead sports activities and repeated use of shoulder at workplace may lead to sliding of the upper arm bone, the ball portion, from the glenoid-the socket portion of the shoulder. The dislocation might be a partial dislocation (subluxation) or a complete dislocation causing pain and shoulder joint instability. Shoulder joint often dislocates in the forward direction (anterior instability) and it may also dislocate in backward or downward direction. 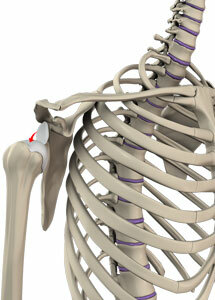 Most common symptoms of shoulder dislocation are pain and shoulder joint instability. Other symptoms such as swelling, numbness and bruising may occur. At times, it may cause tear in the ligaments or tendons of the shoulder and nerve damage. Your doctor will examine your shoulder and may order an X-ray to confirm the diagnosis. The condition is treated by a process called closed reduction which involves placing the ball of the upper arm back into the socket. Following this, the shoulder will be immobilized using a sling for several weeks. Ice may be applied over the area for 3-4 times a day. Rehabilitation exercises may be started to restore range of motion, once the pain and swelling decrease.